Coat potatoes in a thin layer of EVOO. 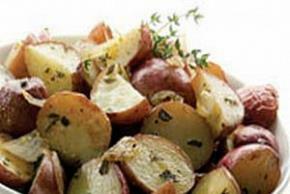 Sprinkle with spices and toss potatoes. Roast in oven for 20-25 minutes until golden brown on potatoes' edges.